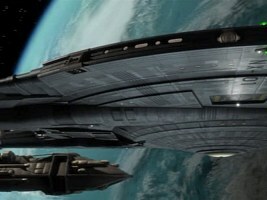 ENT: "Bounty" features the ship ofCaptain Goroth. This design does not have much in common with other Klingon vessels, although it is derived from the Klingon shuttlepod from "Broken Bow". The unusual look and the lack of familiar details does not really give away the size of this vessel. 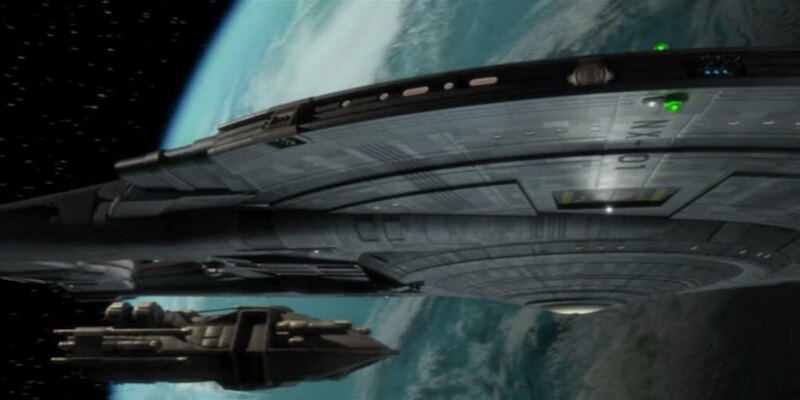 Although Goroth's ship in ENT "Bounty" appears in the same frame with Enterprise, and Enterprise passes behind her, there is no way to judge the relative sizes directly. Enterprise is much farther away when she passes behind Goroth's ship. 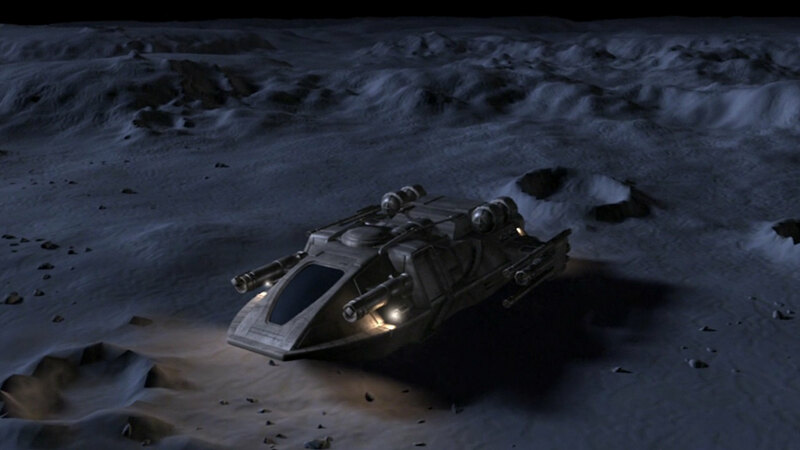 However, Goroth's ship can be directly compared to two other objects: Skalaar's shuttle and the escape pod Archer uses to escape from Goroth's ship. 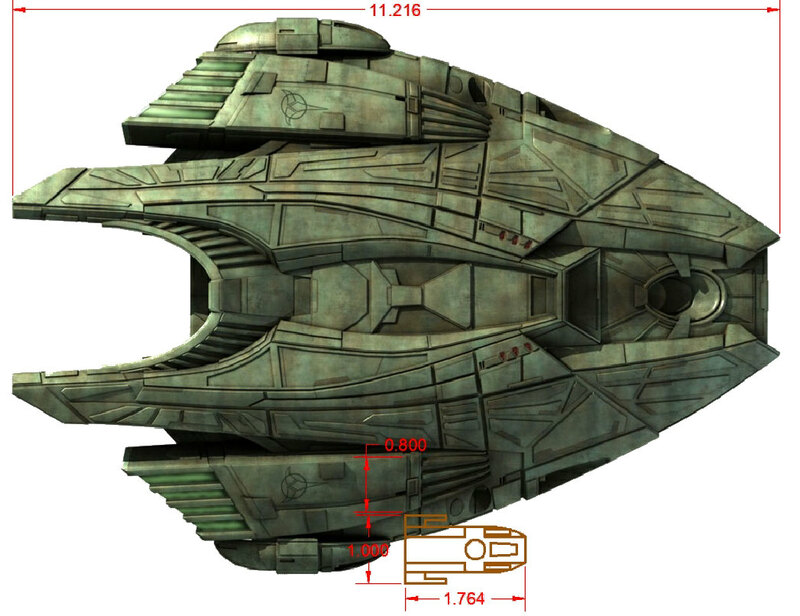 We might be interested in inferring the sizes of these not only to determine the size of Goroth's ship but for their own sake as well. We get a good look at the interior of Skalaar's shuttle (which happens to be a redress of the Delta Flyer). Skalaar is sitting at the controls with Archer imprisoned at the aft end of the cabin when he tells Goroth, "He is standing about five meters from me." Comparison of the interior and exterior of the shuttle allows the cabin to be at least half the shuttle's length, so the shuttle could be as short as ten meters, though examination of screen evidence will lead to a conclusion closer to 15 meters. Archer is precisely six feet tall (as is Scott Bakula) and the ceiling is low, so the cabin interior can't be much less than 2 meters high, or much higher either. 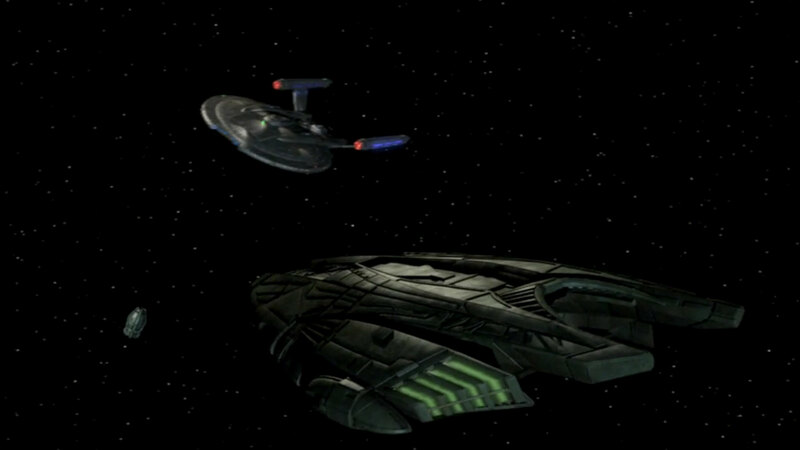 At the very beginning of the episode, Skalaar's shuttle is travelling parallel to starboard of Enterprise. The shuttle's profile shows it to be about 3.9 times as long as high (see Figure 1). This is the overall height, however, and you can see that the cabin's external height is less: the ratio of length to this height is about 5.4. The cabin's structure must have some thickness, say at least 0.2 meters, making the cabin's external height no less than 2.4 meters, so the shuttle's length can be no less than 13 meters. The clincher is the docking port on the side which has nearly the same height as the cabin. There is no reason for it to greatly exceed a typical Tellarite's height, so the external height of the cabin isn't probably much more than 2.5 meters, say 3 meters maximum, which puts the upper limit of the shuttle's length at about 16 meters. As the shuttle and Enterprise pass by, we are also afforded a rear view of the shuttle, which reveals that the ratio of overall height to width is about 0.45. Therefore, the ratio of length to width is about 1.75. This will be useful later on. There is a tempting opportunity to determine the shuttle's size in this scene, but it requires an assumption and yields a dubious result. If we assume the two ships are passing by at the same velocity, a feature on Enterprise that we saw alongside the shuttle as it passed in front of the observer should now be about the same distance away as the shuttle. The feature is the cut-out in the saucer at the base of the boom; its width (see Figure 2) isn't significantly foreshortened, and the shuttle has the same apparent width, so we have another way to estimate the shuttle's size. 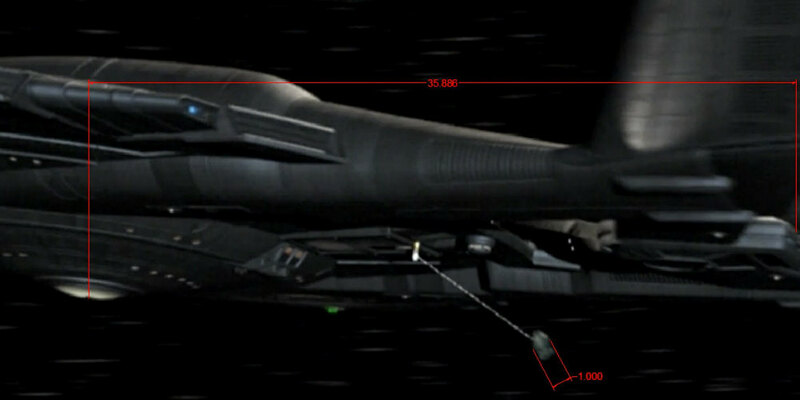 Based on drawings of NX-class starships, this width is about 14 meters, making the shuttle about 25 meters long. This greatly exceeds the estimate we have based on the hatch. However, we assumed the two craft passed by at the same speed. If the shuttle is being overtaken by Enterprise, it's actually nearer in Figure 2 than we assumed and only appears that large. As an aside, there is the comparison between Skalaar's and Kago's shuttles to be made when Kago intercepts, pursues, and fires upon Skalaar. Kago's shuttle is stated elsewhere to be approximately 25 meters long. 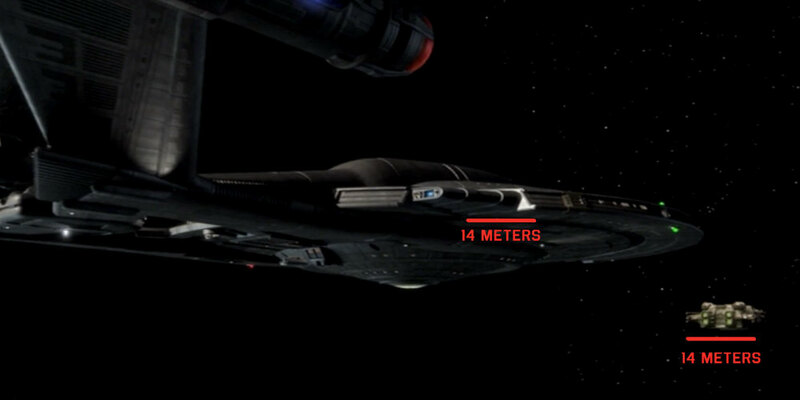 This is reasonably consistent with Skalaar's shuttle being 13 to 16 meters long, since examination of screen captures shows it to be roughly twice the length of Skalaar's shuttle. A more precise calculation of their relative sizes could be accomplished using the assumption that their docking ports are identical in size, since these should be made to a common standard. 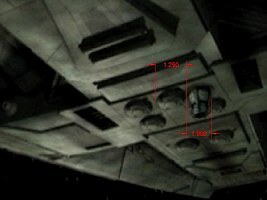 The size of Goroth's ship can be inferred from the escape pod, which appears onscreen in close association with her and with Enterprise, whose dimensions are known. (This is done in the next few figures using screen captures with relative dimensions superimposed, with a chosen feature's size defined as 1.) 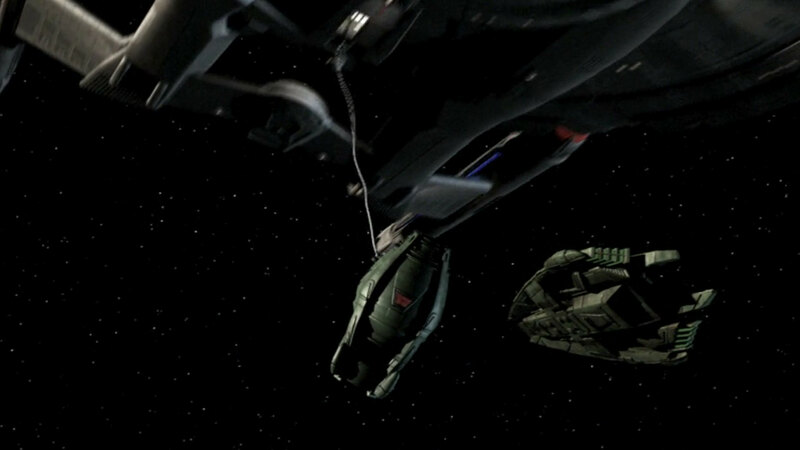 When Archer escapes from Goroth's ship, we see him enter the escape pod through a hatch that appears to be a little under a meter in diameter and half the diameter of the pod's interior, so the interior of the pod is a little less than 2 meters. This puts a lower limit on the external diameter of the pod. The escape pod is shown emerging from the underside of the ship, with a circular hatch sliding out of the way. 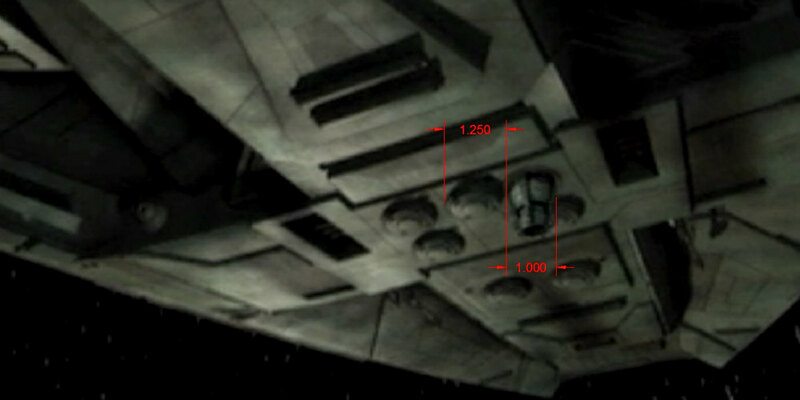 The hatch is 1.25 times the diameter of the pod (see Figure 3), and an orthographic view of the underside from Doug Drexler's former Drex Files shows the overall length is about 29 times the diameter of the hatch (see Figure 4). 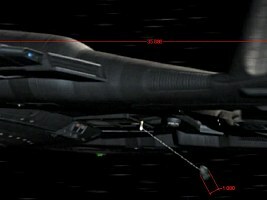 We can compare the escape pod directly to Enterprise in the scene where she takes the pod in tow (see Figure 5), and Enterprise's length is known to be 225 meters. 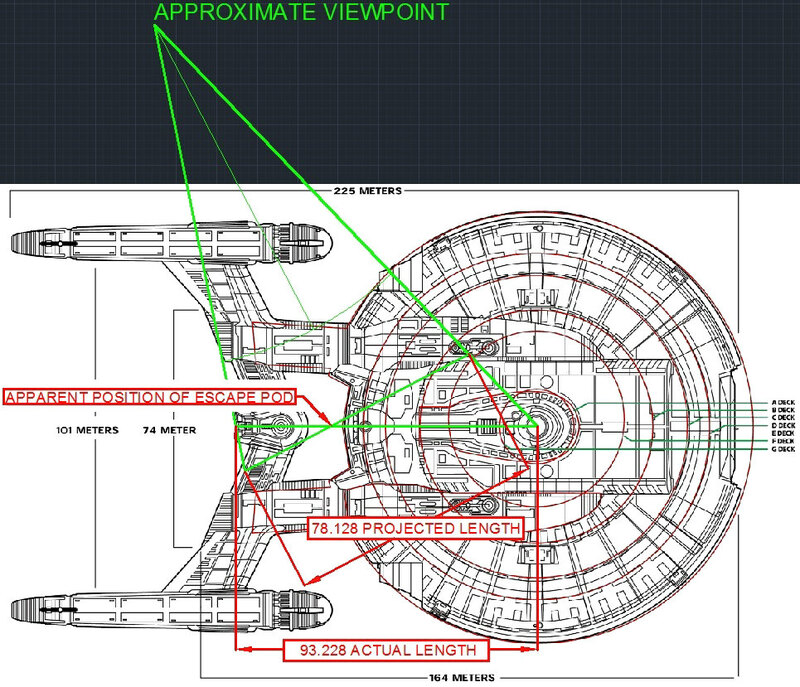 Although the reference length I chose (the distance from the center of the lower sensor dome to the back of the warp field governor) is slightly foreshortened, it was possible to compensate for it and compute the projected length to which the diameter of the pod should be compared (see Figure 6). This yields a diameter slightly less than 2.2 meters. Since the inside of the pod is a little less than 2 meters, this seems to be the minimum size. Given what we know of the pod's size relationship to Goroth's ship, we get an estimate of its length of about 78 meters. 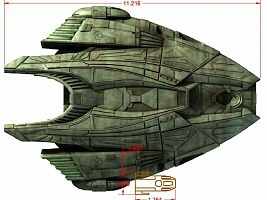 Allowing a 10% margin of error, Goroth's ship could be anywhere from 70 to 85 meters long, though figures lower than 78 meters are basically impossible due to the minimum size of the escape pod. Perhaps the margin of error isn't conservative enough and should be increased to 20%. 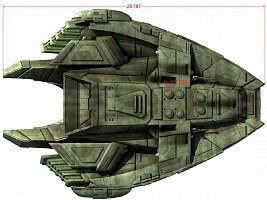 This yields a maximum length of 92 meters, and the length of Goroth's ship is then between 78 and 92 meters. 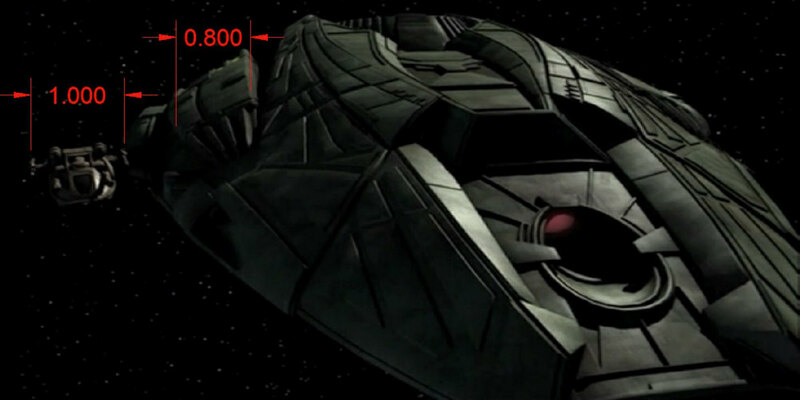 Finally, we can estimate the size of Goroth's ship when Skalaar's shuttle comes alongside the starboard side to dock. Our vantage point is very close, so perspective makes size comparisons difficult. 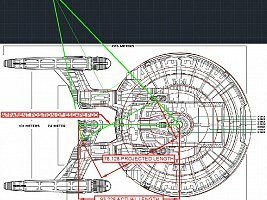 Nevertheless, we can judge that Skalaar's shuttle is much smaller, and is a little wider than the part of the warp nacelle on Goroth's ship that it is alongside (see Figure 7). 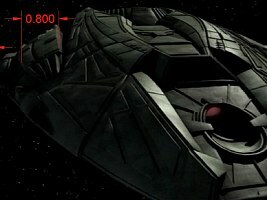 Given what we know of the length to width ratio of Skalaar's shuttle, we can infer that Goroth's ship is about 6.35 times as long as the shuttle (see Figure 8). 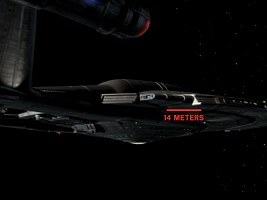 Since the shuttle's length is between 13 and 16 meters, Goroth's ship is between 82 and 102 meters. This is overlaps with what we inferred from the escape pod: that the length of Goroth's ship is between 78 and 92 meters. There is of course uncertainty in the comparison between the two vessels. But without getting into further discussion of error analysis, we can state that Goroth's ship is probably between 82 and 92 meters in length.